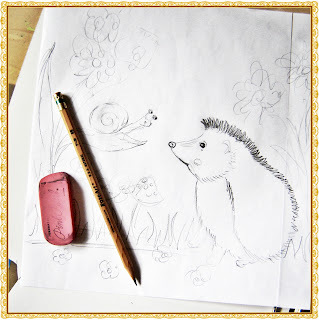 Gracie, Annelie, and I sat down yesterday to sketch hedgehogs. I love Gracie's the best. She was so proud of her hedgehog, as well, and decided that she was going to put it in her Etsy shop (she actually said that) which she named "Strawberry Short." It cracks me up, because she talks about her Etsy shop all the time. And consistently calls it "Strawberry Short," which she came up with about three months ago. My kids never fail to amuse me. 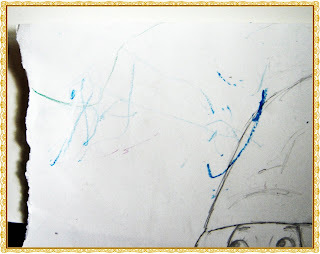 I love how Annelie used my Gertie the Garden Gnome sketch as her paper, despite the fact that I gave her several unused, sparkling white papers of her own (which she promptly brushed to the floor). Some artists find it difficult to draw on a brand new piece of paper. I guess it can be intimidating. I love how Gertie is looking on, as if to say, "Don't you dare come close to my hat, little baby." And here is mine, which I'll be coloring in soon. The background will of course, look a little neater! I'm not much into sketching, and generally my sketches look like something an eight year old would draw. Just look at those atrocious flowers!! Yes, I did bust open my moving box and retrieve my colored pencils, in case you are wondering. I just can't help myself!! I love that snail. How cute is his little face? I would shop at Gracie's Etsy shop! How cute! OMGosh tooo cute- i think they did awesome and what fun. Gracie wants to be like mommy- so sweet. I wondered how long it would take you to do that. Cute sketch. Gracie's drawing is wonderful, too. 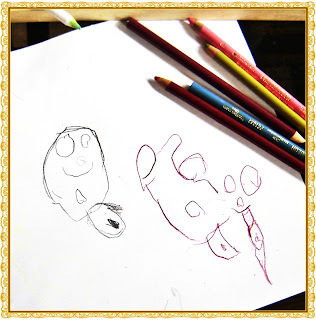 Ummm... when I was 8 years old, I NEVER drew anything as beautiful as what you create. At 34, I still don't.